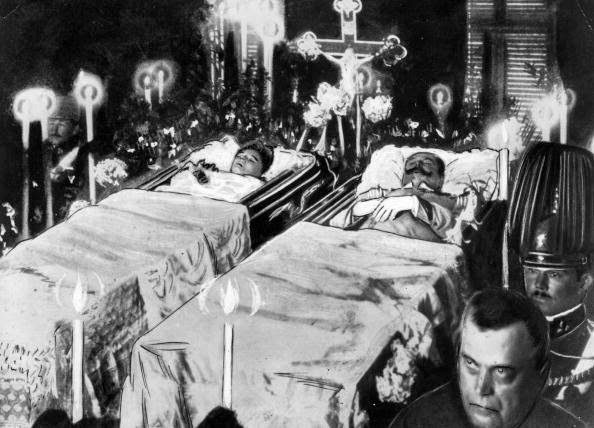 Archduke Franz Ferdinand and his wife were buried with appropriate ceremony in the Austrian town of Artstetten despite a pouring rain. The storm foreshadowed the coming disaster that was to wash across the continent in just three weeks. Few forecast the catastrophe awaiting the world. Certainly not the "well-informed correspondent" cited by The Daily Telegraph of London. He wrote that "it may confidently be expected that the Monarchy will continue to pursue the pacific and steadfast policy which is notoriously dear to the aged Emperor and his confidential advisers. Nor will the loss of the Heir Apparent ... affect that policy in the long run." Oh, really? Nothing could be further from the truth. Only two years ago, Austria-Hungary conquered Bosnia-Herzegovina in one of the two Balkan wars of that period. The Austrian military was now casting a covetous eye on Serbia, one of whose citizens was responsible for the assassination of the Archduke. That killer, Gavrilo Princip, had sought avenge the taking of Bosnia and its capital, Sarajevo. Germany was urging the Austrians to act. The newspaper took at face value the judgment of the "well-informed correspondent." Behind the scenes, European militaries were reviewing their war plans, just in case. Germany's plan was most advanced, having been in place for nearly a decade. As usual, the Germans' was most thorough. Their Schleiffen plan was so detailed that it contained railroad schedules listing how many trains of troops, armaments and supplies would pass a given train bridge en route to assembly points should mobilization be decreed. France had its Plan 17, which depended on sheer bravery for an offensive to retrieve its lost provinces of Alsace and Lorraine from Germany and to then capture Berlin. Russia, as usual, had a plan that was a mess. Austria-Hungary had to plan for two fronts, the the Serbs and their pan-Slavic supporters, the Russians. Other than the funeral, nothing new emerged from the public press on the impending disaster. The editors may have decided that they had been down the road too often before. 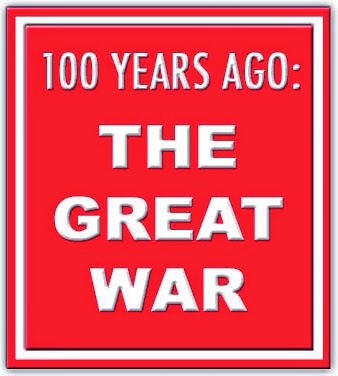 There were crises in the Balkan wars of 1912, the German Kaiser's bellicose statements, and the Germans' naval armaments program. Perhaps the editors felt this road had been trod so many times it was reasonable to expect that things would work out fine this time. The major news in Britain was the continuing quest for women's suffrage and home rule for Ireland. In the latter case, Unionists on July 5 demonstrated in South London against the proposal to give Ireland some autonomy from English rule. Also in The Telegraph was continuing evidence of labor unrest, a phenomenon that was becoming increasingly common in the United States as well. Workers wanted better wages and working conditions, having recognized that the owners of the factories had ample profits to accommodate their demands. In the latest incident, 4,000 engineers and skilled workers went on strike at the Royal Arsenal in Woodrich. The trigger was the installation of labor-saving machines in the carriage department. The strike soon spread to other departments, with the expectation of the walkout expanding to 8,000 workers the next day. In New York City, the big story was the accidental bombing of a seven-story tenement on Lexington Avenue on July 4. One of the apartments belonged to Louise Berger, an editor of Mother Earth News. 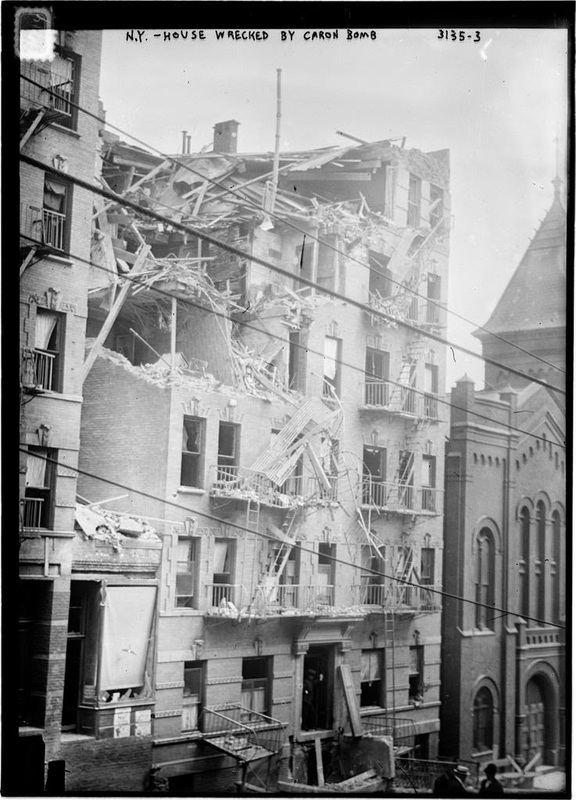 Three Anarchists were storing dynamite in the apartment with the intention of using it to bomb the home of John D. Rockefeller in Tarrytown, New York. The dynamite went off prematurely, killing 11 people, including the three Anarchists. The story in The Telegraph carried the headline, "Hoisted on Their Own Petard." The Anarchists were members of the International Workers of the World, which sought to supplant capitalism with worker democracy. Berger was unharmed, having left her apartment 15 minutes earlier to go to work. A second IWW attempt to kill Rockefeller failed in 1915 when a gardener at the Rockefeller estate discovered the bomb and police defused it. Public morals were much stricter before the war began. The Telegraph tells the tale of a court case involving a man who accosted a female on the street using the word "dear" to address her. He asserted that he was an acquaintance of hers. The woman strongly rejected that claim, but the man kept following her, insisting that they knew each other. She summoned a policeman, which led to the man being put in the dock. His defense: His poor eyesight led him to believe that they knew each other.